1. Someone who professionally studies and conducts research in astrophysics. 2. A student of astronomical physics. 1. Someone who does not believe in a God or gods or who denies the existence of Divine Beings, or Deities: An atheist believes there is no God while an agnostic believes human beings can never know whether there is a God or not. 2. A person who denies, or disbelieves, that there is any such thing as a Supreme Being or beings: Joe's friend, even though he is an atheist, still enjoys having long philosophical discussions with the archbishop of the local church. 3. A disbeliever, an unbeliever, a nonbeliever, a denier of God's existence, a godless person: Laura believes in the existence of God, but her brother is an atheist and he thinks his sister is silly to believe that there is any such thing as a God. 4. Etymology: from French athéiste, from ancient Greek atheos, "godless, denying the gods"; from a-, "without, no" + theos, "god". As an atheist, I proclaim that if there were a God, would people like this poor man be allowed to be in such miserable conditions? This is just one example of how so many people in the world are suffering and which proves to me that there is no God. Someone who studies the science of aqueous vapor. 1. The study of hearing disorders, including evaluation of hearing function and rehabilitation of patients with hearing impairments. 2. A person who is trained or skilled in audiology. 3. Someone who is skilled in the science of hearing, including the rehabilitation of patients whose hearing can not be improved medically or surgically. 4. A health care professional who is trained to evaluate hearing loss and related disorders, including balance (vestibular) disorders and tinnitus (ringing in the ears) and to rehabilitate individuals with hearing loss and related disorders. An audiologist uses a variety of tests and procedures to assess hearing and balance function and to fit and dispense hearing aids and other therapeutic devices for hearing. Someone who is trained in the use of an audiometer used in testing one's hearing abilities. 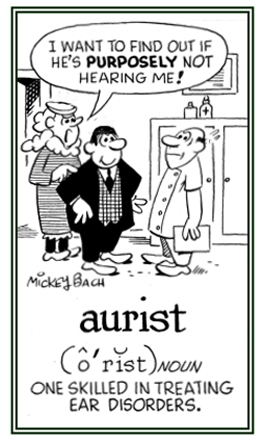 A medical specialist in the diagnosis, medical treatment, and surgery of the ears, including their anatomy, physiology, and pathology: Trudy was happy that she found an aurist in her town who was skilled in taking care of and curing the disorder of her daughter’s ears. © ALL rights are reserved. Someone who strives for autonomy or independence. A person or people who are pretending to be mystical or mysterious. 1. The spontaneous cure of a disease; self cure. 2. The treatment of a disease with filtrates from a patient’s secretions. 3. Treatment of one’s own infirmity (illness). Someone who cuts his/her own hair or who looks as if he/she cuts his/her own hair. 1. Someone who has an excessive desire for material gain and greediness for all kinds of wealth: Fay's husband was an avartist who was able to become a billionaire; however, since he couldn't take his wealth with him, his wife inherited his fortune. 2. A person who has an uncontrolled desire for almost anything; including, food, drink, money, or emotional gratifications: Glen is an avarist who likes to help people whenever he can because he always expects to receive praise for whatever he does for them. Someone who keeps an a collection of birds or an aviary. A person who cares for and rears birds in cages, aviaries, or other kinds of enclosures. Showing page 8 out of 71 pages of 1051 main-word entries or main-word-entry groups.